Irene Lilly McCutchen and William McCutchen Jr.
Irene Lilly McCutchen and William McCutchen Jr. will be honored by the Indiana University Lilly Family School of Philanthropy during the Indiana University-Purdue University Indianapolis (IUPUI) Spirit of Philanthropy Awards ceremony April 13 in Indianapolis. “We are grateful to be honored by the Indiana University Lilly Family School of Philanthropy. 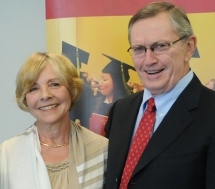 We want to offer our deep appreciation to the people who created the Center on Philanthropy at Indiana University in 1987 and to all those who established the school - officially named on April 9, 2013,” the McCutchens said. The McCutchens make philanthropy a part of their daily lives through their volunteer work and generous giving and have long been active in many nonprofit and charitable organizations. Both are volunteers in higher education: Irene serves on the Lilly Family School of Philanthropy’s Board of Visitors and Bill co-chairs a campaign for Duke Divinity School. A generous lead gift from the McCutchens to the Lilly Family School of Philanthropy was instrumental in establishing an endowed deanship honoring the school’s founding dean. In addition to helping the school attract outstanding deans, the gift makes it possible for the school’s dean to nimbly and creatively respond to challenges, take advantage of opportunities and fulfill the school’s mission. The gift was made through the Ruth Lilly Philanthropic Fund. In 2014, Indiana University President Michael A. McRobbie presented Irene with the inaugural Lilly Family School of Philanthropy Medal of Distinction, which is awarded to those who have made an outstanding contribution to the school through their talents and service. Irene earned her bachelor’s degree at Duke University and is a life-long civic leader. An Indiana University alumnus, Bill earned a Ph.D. at the Kelley School of Business in Bloomington. He is a former professor of management at the Zicklin School of Business, Baruch College, City University of New York, and previously was a senior executive at Eli Lilly and Company. The annual IUPUI Spirit of Philanthropy luncheon and ceremony is sponsored by IUPUI and the Indiana University Foundation. The Lilly Family School of Philanthropy is dedicated to improving philanthropy to improve the world by training and empowering students and professionals to be innovators and leaders who create positive and lasting change. The school offers a comprehensive approach to philanthropy through its academic, research and international programs and through The Fund Raising School, Lake Institute on Faith & Giving, and the Women’s Philanthropy Institute. Follow us on Twitter @IUPhilanthropy or “Like” us on Facebook.